Take time to review permit requirements of your local jurisdiction. Permitting rules and processes differ among different cities and counties. Understanding all local requirements will allow permit applicants to submit a complete and accurate permit application packet the first time. Contact the local electric utility early in the permitting process (solar PV installations). Local electric utilities have a completely separate approval process from the local jurisdiction's permitting process. Some electric utilities may require that the solar project be reviewed before the local jurisdiction issues a building permit. Pursuing utility approval early in the permit process enables the solar PV system to become operational as soon as possible. Make sure that the solar installation that is built matches the submitted plans. The on-site inspector will verify that the installation aligns with proposed plans and any changes may require corrections and additional inspections. Initial Inspection—Either a structural engineer, a licensed electrician, or both, will need to ensure that your structures have been properly engineered, and your wiring is up to code. Plan Your System—When applying for a permit, you need to know the size of your system. Don't buy yet, though. Wait until your building permit and utility permit have been approved (see next step). Apply for Proper Permits—Submit appropriate applications to get permission from the proper entities. Typically, this includes your local building department and utility company. Buy your solar system!—Once your permits are approved and you've received permission to proceed, it's time for the fun part: Buying your solar system! Hey, we know a great company called Wholesale Solar that can help you with that! Install Your Solar System—NOTE: If you're installing a ground-mounted array, you may need an additional inspection by a soils/structural engineer to confirm soil density. Then, another inspection after drilling your post holes to make sure they are deep enough for your ground-mount to be structurally sound. Final Inspections (Building and Utility)—The building department needs to take a final looksee before giving you the green light. Once the building department gives you a green tag, the utility company comes out for final approval. Commission Your System—Now is when all your hard work pays off. This just means it's finally time to flip that switch and start generating your own electricity! Okay, let's dive a little deeper into each of these steps. When it comes to installing solar panels at your home or business, there are two basic types of installations: roof-mounted solar panels, and ground-mounted solar arrays. When considering a roof-mounted installation, it's essential to make certain your roof can bear the load of the panels. Your home's blueprints should indicate its structural engineering. If you don't have blueprints, you may need to hire a structural engineer to inspect the roof for you. An initial electrical inspection may also be needed before proceeding. In some older homes, the wiring may not be up to current code, or the service box may limit the amount of electricity you're able to backfeed to the grid. If you're planning to build a new structure such as a gazebo, arbor, or patio covering to hold your solar panels, the structure needs to be designed by a structural engineer and approved by the building department. In certain areas, ground-mounted solar arrays require soils engineering, to determine the soil class. For example, sandy soil may require larger footings for the ground mount; and rocky soil may not require as large of footings. As you can see, there are several scenarios that may require an initial inspection. When in doubt, check first with your local building department. Now that you know what infrastructure you're working with, it's time to plan your system. You'll need to submit detailed system info when applying for your permits, so it's best to plan ahead. You DO have your system all planned out by now, right? If not, visit Wholesale Solar's Solar Cost page to determine what size solar system you need to meet your energy objectives. If you have questions, call one of our solar experts at Wholesale Solar at 1-800-472-1142, and we'll be happy to help you. For solar PV installations, you will likely need to purchase a building permit, an electrical permit, or both, to legally begin installation. First, you submit a permit application to a local permitting agency, known within government as the "enforcing agency." Your solar PV system cannot be commissioned (i.e., turned on) until approval is granted by BOTH the local agency and the local utility. 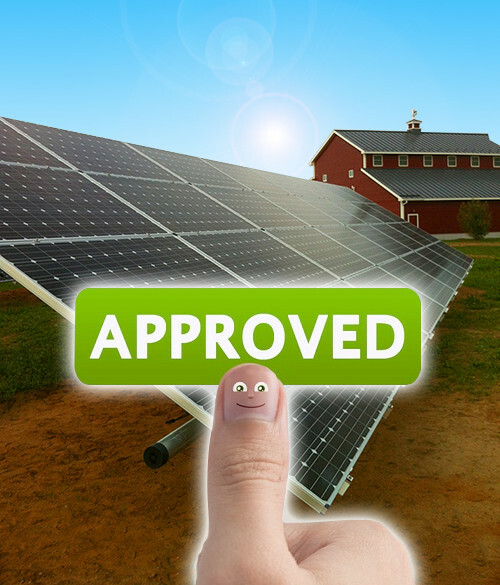 Once your proper permits are in place, it's time for the fun part – purchasing your solar system! Wholesale Solar is a 100% employee-owned company based in Mt. Shasta, California. We have an experienced team of solar experts who can help you through the process of buying solar. We are excited to share our passion for solar with our customers. Our goal is to provide excellent value, knowledgable assistance, and expert support. Many of our employees have solar on their own homes, including a few who are living totally off grid. That's why we like to say, we don't just sell solar, we live it! We sell top-quality products from manufacturers we trust, and we don't desert our customers after we ship their orders. Instead, we provide expert technical support before AND after the sale. As an employee-owned company, we are invested in your success, so we want your solar project to go smoothly. If you have a great experience with Wholesale Solar, we encourage to leave a Google+ review, or refer our company to people you care about when they decide to invest in solar energy. A Note About Shipping: Receiving a freight shipment is a lot different than getting a package from Amazon via UPS. Wholesale Solar has produced a video called "4 Steps to Successful Freight Delivery" that educates customers on the proper steps to receiving and inspecting their solar system when the shipment arrives. We suggest watching before ordering your system so you know exactly what to do when your shipment shows up. Visit our Shipping Information page. Many customers ask us if Wholesale Solar installs the systems we sell, and the answer is no. When it comes to installation, our customers do one of two things: Install it themselves, or hire a licensed electrician or general contractor. A large majority of Wholesale Solar customers are handy DIY (Do-It-Yourself) customers. They are rolling up their sleeves, and installing their own systems with the occasional help from family and friends. These people especially appreciate Wholesale Solar's after-the-sale service, because it means they won't be left in the dark if they come up against a question or problem during installation. As for customers who don't want to install their own systems, we recommend contacting a general contractor, electrician or roofing company for help with their project. In order to make the installation a little easier, Wholesale Solar produces custom wiring diagrams for each solar system we build. Wholesale Solar's electrical Wiring Diagrams are CAD (computer-aided design) drawings that show the electrical sequence of all equipment in a system. An electrical diagram is not only a helpful guide for our DIY customers who put together their own system, but it's also an invaluable resource during the permitting process and system installation. An electrical diagram WILL be required when applying for your permit and for final inspection, so keep it handy before, during and after your solar installation is complete. And finally, if you hire a licensed installer, our custom electrical diagrams will make their jobs easier as well. After all, a detailed design diagram from the company that built the system will benefit even the most knowledgeable installer. NOTE: When building a ground-mounted solar array, you typically set 3" steel pipe in concrete to support the solar panels and racking. In some cases, your local inspector will need to come out once the holes are drilled, to make sure they're the proper depth to support the structure. Check the requirements in your area before pouring concrete and setting pipes. After the solar installation is constructed, it is inspected by the enforcing agency to ensure it complies with applicable building codes and local ordinances. The on-site inspector will verify that the installation aligns with proposed plans, so make sure the solar installation that you built matches the plans you submitted to the agency. Any changes, deviations, or variations may require corrections and additional inspections. You'll also need to have an electrical inspector sign off on the final installation to make sure it's code-compliant. The utility company may require you to add a second meter, or replace the existing one with a bi-directional meter. Most PV-related electrical codes are based upon national electrical code standards, so it pays to be familiar with those. Download NEC Code Article 690 to learn more about code-compliant PV installations. Once you've gotten approval on your newly legal solar install from the utility company and local or state agencies, you're ready to commission your system. It's finally time to flip that switch and start enjoying the benefits that come with producing your own renewable energy! Whether your goal is to lower your energy bill, reduce your carbon footprint, or gain complete energy independence, installing your new solar system from Wholesale Solar is an important first step. Of course, you must follow the proper guidelines to ensure a safe, legal, and compliant solar system installation. Check with your local municipality to get the process started. It's a pretty involved process between deciding to invest in solar, and flipping the switch on your new system, and Wholesale Solar is here to help you make the leap. Feel free to call Wholesale Solar at 1-800-472-1142 with any questions you may have along the way. NOTE: Processes in your area may vary. Always check with your local building authority.